tax revenue in the year 2026. Ok, got that? Alright. Now I’m going to talk about education. First, as the report states education is not a silver bullet. So keep that in mind. You can find it on page 18 in the report. 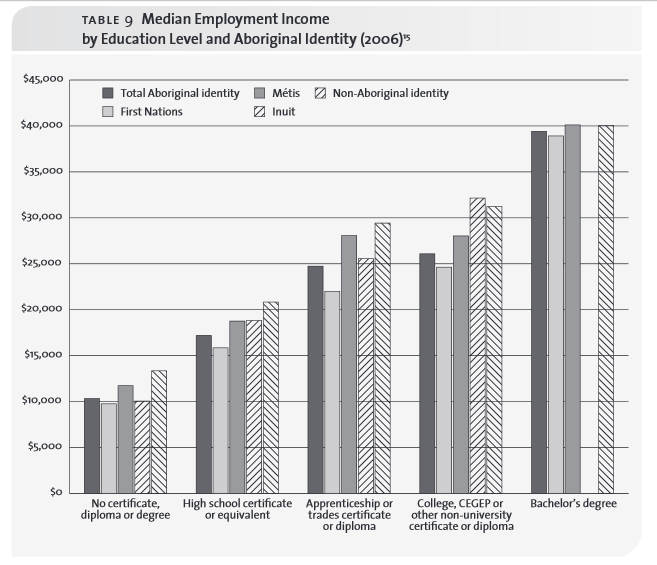 Basically it shows that the wage gap persists until an Aboriginal person is at the Bachelor’s level. 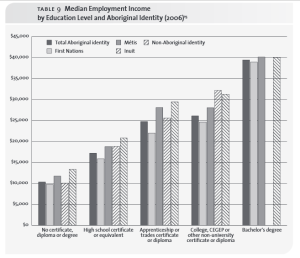 At the Master’s level Aboriginal people are actually slightly higher than non-Aboriginal (subject to age, younger Aboriginal people earning more than younger non-Aboriginal people, but older is reversed). Ok, now for the problems with this. Aboriginal people are more likely to go to post secondary via an alternate route. So we should be making it as easy as possible right? I’ve had two instances this week of oddnesses. First a program allowing Adult Basic Education graduates in but restricting the allowed courses so much that my school only offers four of them. I’m having that student work with a different institution instead where they have a broader admission process and more supports for her. That’s an issue with a particular post secondary institution rather than the government though. Second is the rising cost of Adult Basic Education and the tightening of government run student assistance for those programs (please see more here). If you didn’t finish high school and are low income you can still get funding, but there is very little breathing space. If you don’t succeed on your first try it’s very hard to continue, and there is no funding for living costs. It’s worse if you completed high school but you took a non-academic track. 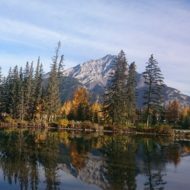 It’s not uncommon for an Aboriginal student to be pushed into an alternate program when they are capable of completing the regular pathway or capable with a small amount of support. Then there is almost no funding outside band funding, and that is subject to it’s own issues. The message that’s being sent is that yes the income gap doesn’t narrow until you have a degree, but we’re going to make it difficult for you to pass the gateway to begin that degree. Don’t even get me started on band funding. There is a finite amount of money given to bands who then need to decide who gets how much funding. The problems are quickly apparent. If you want to encourage a group to go to post secondary studies perhaps capping the funding is a bad idea. It doesn’t take into account the increasing cost of a single student attending post secondary or the increasing numbers of people wanting to attend. If you want to work on closing the income gap lets make receiving or upgrading your Graduation Diploma easy and lets make it easy to progress from that point into post secondary. One way of closing the gaps is improving education. So rather than making it harder to obtain, let’s make it easier.